The Gut Cleanse Bundle provides specific herbs, vitamins, probiotics and natural fibre sources for gut cleansing, liver detoxification and supporting intestinal health. Research now shows a healthy gut and balanced intestinal flora are an important key to weight loss. Use the Gut Cleanse Bundle to jumpstart healthy weight loss, assist in weight management and support gut health. 3C Complete Colon Cleanse is used for gastrointestinal detoxification with excellent sources of fibre for proper bowel cleansing and relief of constipation. Additionally, it also contains herbs to heal the gut and support intestinal health. Probiotic 7-in-1 is used for balancing intestinal flora by re-establishing and replenishing good gut bacteria. Additionally, it supports healthy digestion, metabolism and immune function. Taraxa contains specific herbs that stimulate liver detoxification. In addition, it contains lipotrophic factors and herbs for to promote liver function and protection. This product is intended for doing a 10 day liver detox. 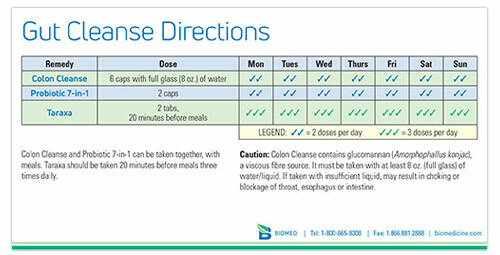 Directions: Take 2 caps of Probiotic 7-in-1 and 3 capsules of 3C with 8 oz of water twice daily. At a different time, take 2 tabs of Taraxa three times daily. Or as directed by a health care practitioner.